Cranberry and turkey is a perfect match any time of year! Top off a cream cheese bagel with some red onion slices, deli-sliced turkey and a dollop of cranberry sauce for a sandwich that's anything but ordinary. Top bottom half of bagel with onion, turkey and cranberry sauce. Cover with top of bagel. 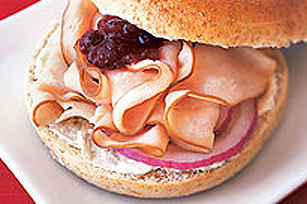 This sandwich is a great way to use up any leftover cooked turkey, and cranberry sauce, from your holiday dinner.